Sealaska Heritage Institute (SHI) and the University of Alaska Southeast (UAS) are offering new scholarships and opportunities to Alaska Native students enrolled in the Preparing Indigenous Teachers and Administrators for Alaska Schools program, known as PITAAS. 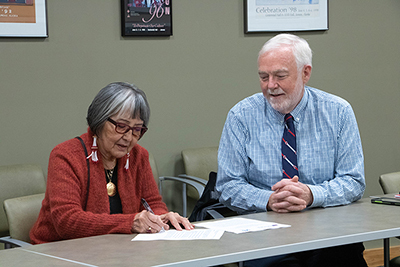 SHI and UAS are offering the initiatives under a new memorandum of agreement through which the institute will be a full partner of PITAAS, a program founded by the university in 2000 to grow the number of Alaska Native teachers and administrators and improve educational opportunities for Alaska Native K-12 students. Through the program, which is funded by a federal grant from the Alaska Native Education Program awarded to SHI, the partners will offer tuition waivers to Alaska Native freshmen and sophomore students who are interested in PITAAS for certain language and culture classes, said SHI President Rosita Worl. The tuition of PITAAS junior, senior, graduate and Ph.D. students is already supported by the program. “Our end goal is to improve the success of Alaska Native students, and we know they do better academically when their languages and cultures are incorporated into schools. Having Alaska Native educators who are knowledgeable in those areas is a key part of that,” Worl said. “We're excited to partner with SHI in this expanded effort,” said UAS Chancellor Rick Caulfield. “This partnership is significant, not only for the support of students in our teacher and administrator preparation programs, but for the tremendous number of Alaska students they will impact in the span of their careers as educators and role models." SHI and UAS also will launch a Teacher of Distinction program, which will include an award ceremony and monetary prize for an outstanding teacher. The program also will fund SHI’s annual lecture series and the UAS oratory competition and Native graduation ceremony at UAS. CONTACT: Amy Fletcher, SHI Media and Publications Director, 907.586.9116, amy.fletcher@sealaska.com; Ronalda Cadiente-Brown, UAS Assistant Dean, Indigenous and Multicultural Education and P.I.T.A.A.S.Director, 907.796.6058, rcadientebrown@alaska.edu. Caption: SHI President Rosita Worl, Ph.D., and UAS Chancellor Richard Caulfield, Ph.D., at a recent ceremony to sign a new memorandum of agreement to partner on the PITAAS program. Photo by Lyndsey Brollini, courtesy of Sealaska Heritage Institute.